(without stand or speakers) 40.0" x 26.8" x 4.6"
This JVC 42" Class LCD television with stylish cosmetics, takes into consideration every feature the demanding digital customer is looking for now and for the future. 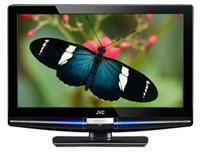 It offers a 5000:1 Dynamic Contrast Ratio, 500 cd/m2 and a 178 Degree Viewing Angle. This units connectivity takes into consideration today's digital world and includes an ATSC Tuner, 3 HDMI Inputs, USB Photo Viewer and a Component Video Input. Ideal for any room in the house!